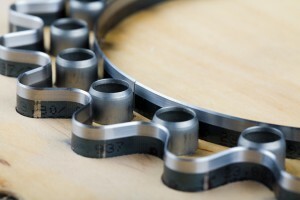 Interstate Specialty Products provides large format die cutting services for a wide array of non-metallic materials. Our expanded capabilities include high tonnage presses that are 75” wide, digital die-less cutting systems that can process extremely large formats up to 120”, and digital die-less cutting systems for challenging materials such as thin-mil foams and foams over 1.5” thick. Interstate’s 75”-wide high tonnage presses can die cut higher-strength, non-metallic materials in larger sheet sizes. With die cutting, each press has a specific capacity or pressure (tonnage) available during the down stroke of the press head. The tonnage that’s needed to die cut a material is a function of the material’s strength, the part’s size, the type of precision die cutting process, and factors such as air-pressure buildup. Digital die-less cutting eliminates the time and expense of machine tooling while providing closer tolerances and exceptional edge quality. Interstate’s digital die-less cutting services for formats up to 120” extend these important advantages to extremely large part sizes. Medical, scientific, and electronics applications include die cut plastics, rubber, specialty composites, Porex, Poron, PTFE, and various gasketing materials. Interstate’s digital die-less cutting for difficult or hard-to-cut materials is ideal for thin-mil foams and foams over 1.5” thick. Typically, ultra-thin foams for medical devices and electronic components are measured in millimeters (mil) and made of materials such as Poron-brand urethane for use in gaskets and pads. Interstate also offers digital die-less cutting for thicker foam materials used for cushioning and insulation. Do you need large format die cutting services for wider parts, extremely large formats, or hard-to-cut non-metallic materials? Are you wondering whether precision die cutting or digital die-less cutting is right for your medical, scientific, or electronics application? To learn more about Interstate Specialty Products’ large format die cutting capabilities, contact us on-line or call (800) 984-1811.